Triflex specially developed the wear-resistant BTS-P system for balconies, walkways and roof terraces exposed to extreme mechanical point loads. Along with its system components Triflex ProTerra and Triflex ProFloor, the full-surface fleece-reinforced balcony and terrace waterproofing reliably protects the load-bearing elements reliably and for many years to come. Triflex BTS-P has a fast-curing polymethyl methacrylate (PMMA) base and withstands high mechanical loads. Various surface finishes and colours are possible and convert a balcony into an extension of your living room. 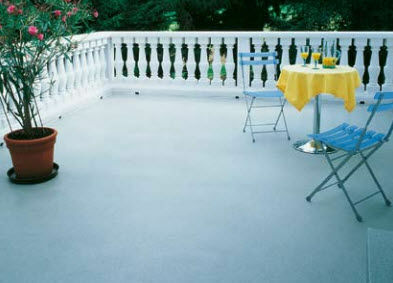 Various dressing options make for an effective non-slip finish with sure footing, and an easy-to-clean surface.